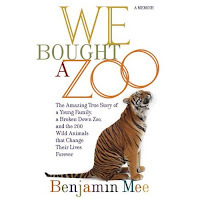 In the market for a house and the adventure of a lifetime, Benjamin Mee decided to uproot his family and move them to an unlikely new home: a dilapidated zoo on the English countryside, complete with over 200 exotic animals. Mee, who specializes in animal behavior, had a dream to refurbish the zoo and run it as a family business. Naturally, friends and colleagues thought he was crazy. Mee’s pipedream became a reality in October of 2006, when he and the rest of the Mee clan—wife Katherine, son Milo (age six), daughter Ella (age four), brother Duncan, and his seventy six-year-old mother—relocated to the Dartmoor Wildlife Park and met their new neighbors, which included five Siberian tigers, three African lions, nine wolves, three big brown bears, two pumas, a lynx, four Asian short-clawed otters, two flamingos, monkeys that wouldn’t stop fighting, several emu, boa constrictors, a llama, and a tarantula. The grand reopening of the zoo was scheduled for spring, but there was much work to be done and none of it easy for these first-time zookeepers. Tigers broke loose, money ran low, the staff grew skeptical, and family tensions ran high. Then tragedy struck. Katherine had a recurrence of a brain tumor, forcing Benjamin and his children to face the heartbreak of illness and the devastating loss of a wife and mother. But inspired by the memory of Katherine and the healing power of the incredible family of animals they had grown to love, Benjamin and his kids resolved to move forward. The Mee family opened the gates of the revitalized zoo in July 2007. Brimming with energy and insight, We Bought a Zoo is a profoundly moving portrait of an ordinary family living in the most extraordinary circumstances. This was a pretty powerful memoir. It combines a family, a dream, hard work, and tragedy. I think for the most part all the elements are pretty well balanced. I was rooting for this family and the success of their zoo and dream. They worked tirelessly to make improvements for the animals and zoo while trying to remain a close-knit family as the author's wife passes away. I loved reading about the author's wife and children, especially his love for his wife. I would have loved to learn a bit more about his other family members as well. The author's mother is mentioned several times but I would have liked to learn more about his siblings. All the stories related to the zoo were pretty amazing. Multiple animal escapes, staff spats, and animal personalities. There was a great deal going on. And I loved it all! At times when the author was talking about the animal enclosers I had a hard time picturing exactly what he meant. I don't know if it was just me or if it's hard for a zoo outsider to understand these things. It was very rewarding to see the zoo's makeover from start to finish and see the staff form and come together to get the zoo ready for inspection. This was a very original true story and I would like to learn more about this family and their zoo since this book was completed! Do you like to go to the zoo? What's your favorite animal? In the book the author talks about a documentary tv that's being filmed about the zoo called Ben's Zoo for the BBC I believe. I tried to find some more information on it or possibly a dvd but turned up nothing. I did find this video though, which is pretty cool! This is in my TBR pile and I can't wait to get to it. Thanks for sharing the video - it's great. I haven't been to the zoo in years but my favorites are always the giraffes, elephants, and penguins! Alea - I've read about this book in the past month or so, but I forgot about it! Thanks for the reminder, it looks fantastic (I love memoirs about "real people") and I'm adding it to my wish list. I have this in my tbr pile. It looks really good. Hopefully it will not make me cry as much as Dewey did. I've seen a few reviews of this. It sounds so neat! I haven't been to the zoo in years but I've always enjoyed going. The tigers will always be my favorite animals to visit. Hmm, this one sounds interesting. I think I may get it for my mother for Christmas, as she loves memoirs. And I LOVE the zoo. I love the koalas and the tigers. But my favorite was when I went to the San Diego Zoo and saw the pandas. The baby one was adorable. I'm a zoo person (zoology degree and plenty of volunteer hours) so I think it would be really interesting to read about taking over a zoo. I'm not sure I can read about him losing his wife though. I'm a cry-baby. And my favorites are sea otters and gorillas, I think. I don't know that I could ever really decide! WOW! Sounds great. Yes, we are zoo people. This sounds like a good one, I'll definitely pick it up! And my favorite animal at the DC zoo is definitely the panda! I saw an interview with this author—a rough cut, actually,of an interview, an the idea of this book moved me deeply. bermudaonion- Yeah it was a really original story! I hope you like it! amee- I haven't been in awhile either, well i did go to a wedding last month but that was only in the aquarium section. what i really would have liked to see is the tapirs! sharonanne- It didn't make me cry but it was pretty sad at several points. Ooh i want to read Dewey! ladytink_534- You know I was wondering if that was it! Thanks! I wish it was on dvd so i could rent it! khyrinthia- This definitely could be a good present, it's very different from what i consider a typical memoir to be. Most people don't live at the zoo! Baby pandas! So cute! kristen m.- Oh wow! I bet you would really enjoy it and you would understand what he was talking about with the animal enclosers! I think you should give it a try, it was sad but he used the zoo to deal with his pain, it's a really lovely story. j. kaye- Go zoo people! s. krishna- Pandas are really cute! beth kephart- It is a really special book! Thanks for the kind words!